Sons axial ax10. 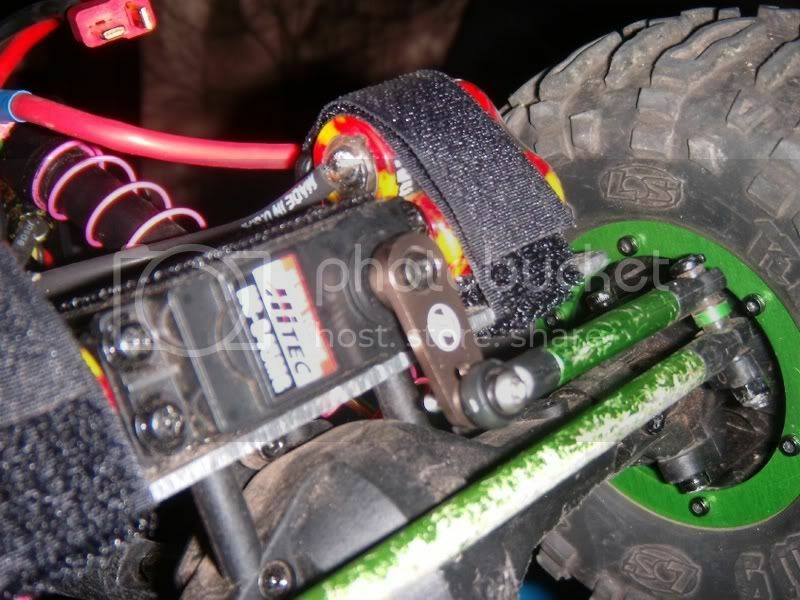 What's the most bullet proof steering servo setup? I've run the steel gear servos, but couldn't find an aluminum steering arm to match up with it, if I run a plastic gear servo it just gets destroyed. If I put the plastic steering arm on the metal geared servo, it lasts him about an hour and the plastic is stripped out. Someone please point me in the right direction. Tired of this thing breaking. IIRC I ran an aluminum arm from Losi, maybe Integy, on mine. I stripped out a bunch of plastic ones, but never had a problem after I got the aluminum one on it. Crappy pic, but it was definitely a Losi arm. I think the stock servo arm set up works pretty good. It has a type of "clutch" inside. I'v only managed to break 1 so far and i hammer on it. And get the best servo you can justify spending the money for. My experience has been the the $50 "high torque" models just don't hold up to the abuse of a crawler.